I had to run to the grocery store for my wife. I begged an hour of fishing as it was a wonderful afternoon. I have wanted to revisit the Fly Rod Spoons for a long time. I headed over to the Wilson Springs ponds. Right now it is being planted every other week with 450 trout 8-10 inches. It is as close to "Area" fishing as we have where I live. The Daiwa Vega .4 gram spoons work well. I bought the "Horizon", "Brown Pellet", and "Green Pellet" to match the pellet food that the hatchery fish are fed. I took a tour last summer of the hatchery across the road from the fishing area, and was able to get my hands on some of the pellets! I began the session with a silver .4 gram Daiwa Vega spoon. The fish would come and look at the spoon and then just swim away! After 3 tries, I thought it was time to see if "matching the hatch" applies to fly spoons. I put on the Green Pellet spoon and on the first cast with the TenkaraBum 40, I had a fish on! It was a nice 10 inch planter. The third cast and retrieve was slammed so hard by a trout that it broke me off. I then switched to the Brown Pellet. After 6 fish in 9 casts, I felt that I had proved that you can "match the pellet hatch!" I then put on the Horizon and caught two fish in 5 casts. I had to end the day trying my all time favorite and that is the Vega Nighmare pattern. I caught my biggest fish of the evening a nice 12 incher. I was using a Cultiva Micro Snap Swivel. It makes changing spoons easy! I sure hope Chris gets the "out of stock" spoons back in soon, especially the Brown Pellet and Green Pellet. I believe color does matter! I had two guys who were fishing corn on a Carolina Rig come over and check out my fishing outfit and watched for about 10 minutes. They thought it was awesome, and the spoons were amazing. I gave them each a TenkaraBum business ard. It is great having a forgiving wife too, I fished for an extra half hour! I think you're right--color counts, at least some of the time. Occasionally I'll fish the same pattern of fly all morning but have different success, depending on what color I use. Other times, it seems as if any color works . . . or no color works. As the fellow said, "That's why it's called 'fishing' and not 'catching.'" With freshly stocked trout I use the Utah Killer Bug to great success if they are feed red or pink pellets. When fed brown pellets I use a Killer Bug tied with Bracken Jameson yarn. So far this has been a great method when I fish stockies. I have not given the spoons a try though. Kyle - I am convinced that often the reason the Golden Ribbed Hare's Ear Nymph works so well is because it resembles a pellet as much as a true nymph. I know that there are those who don't like stockers. I personally like them in some places for three major reason. 1. There are places close to home where I know there are fish that can be caught. 2. I don't mind taking stockers home for eating. 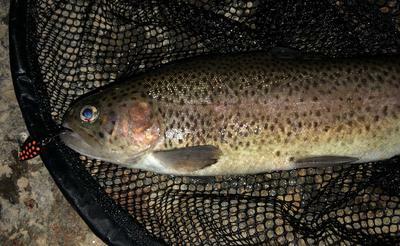 There is a mix of wild rainbows and stocked rainbows in the Boise River. I always let the wild ones go. The stocked trout come from wild stock here in Idaho. If a planted trout survives for about a year, they look like a wild trout, and are often between 13 and 15 inches long. 3. Non-stocked waters are not fished as much by the casual fisherman or woman. This leaves those special places for those willing to venture out and explore. Another reason, is I don't mind talking about places that are planted because most people know about where fish are stocked. It is also a great place to take beginners because the odds are they will catch something.